Planning is key, before ordering chairs and tents decide what time of day your planning to hold the ceremony and reception, this way you’ll order only what’s necessary for the time of day, this also allows you to plan where you’re going to set everything up that you’ll need. Afternoon weddings should have ample shade so your guests don’t feel cooked before the bride makes her way down the isle. An idea for hot summer days is to have a bottle of water under every chair so your guests can stay hydrated and cool while they wait. You might also think about turning your Order of Ceremonies in to fans so your guests get double use out of them. Weddings that take place later on in the day should easily have enough shade to keep the company from feeling like the main course. 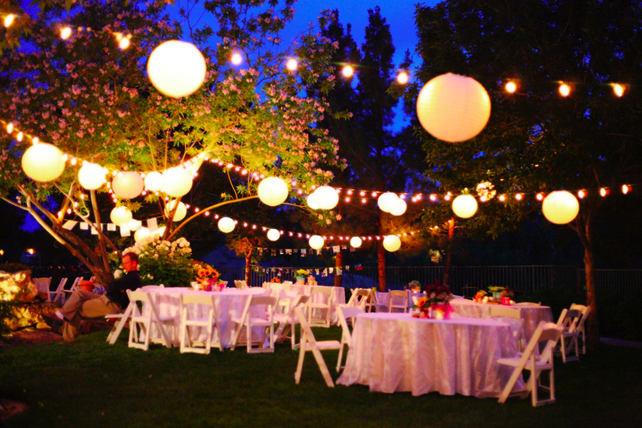 You might even consider hanging string lights for a soft and terrestrial feel, candles might be a bit risky because you never know if some one might accidentally catch their outfit on fire, so reserve the candles for the table tops. Having a tent no matter the time of day makes sense because you never know what the weather is going to do. It can also be a source of shade for your guests to escape the blazing sun if it’s a particularly hot day. It can also double as the dinning room and dance floor later on. You can dress up a tent by stringing lights and hanging drapes from the centre of the tent and using it make partitions so guests who need a break from the dancing can find some solace while remaining part of the festivities. In this part you may also consider putting patio couches and throw pillows for guests to sit on. Unless you’re asking all your guests to contribute a special family dish so all the cooking doesn’t fall on your family, get recommendations for a reputable caterer. Both of these are great ways to take the pressure off your mom and dad. By asking people to contribute food you’re making them more than guests, you’re treating them like family. This way all in attendance get to sample someone’s handy work and can exchange recipes. On the other hand, a caterer will not only bring the food for you, but clean up the mess afterward too. Catering companies have diversified their menu to accommodate any taste, so get referrals and go caterer shopping. You might consider giving your company some honey, jam or preserve that your family makes as a wedding gift. These are more likely to be appreciated than flower vases or photo frames, and they have a practical use. If you’re considering hosting your wedding in your backyard, you should look on line at Pinterest for inspiration. Home style weddings can be just as beautiful as hosting your wedding anywhere else. So if you have the room to do it, definitely consider it when making your wedding plans. Hello I am looking for send off paper lanterns can you please tell me if you have them and if so what the cost is. You can even buy them online if you google “send-off paper lanterns”.